As molecular and cellular biologists move toward nano-techniques for performing experiments on single molecules rather than on populations of molecules, a comprehensive manual on how (and why) to carry out such experiments is needed. Single Molecule Techniques: A Laboratory Manual fills this requirement - it is the first book to take researchers who know nothing about single-molecule analyses to the point where they can successfully design and execute appropriate experiments. Geared toward research scientists in structural and molecular biology, biochemistry, and biophysics, the manual will be useful to all who are interested in observing, manipulating, and elucidating the molecular mechanisms and discrete properties of macromolecules. Techniques range from in vivo and in vitro fluorescent-based methods to the use of atomic force microscopy, optical and magnetic tweezers,and nanopores. 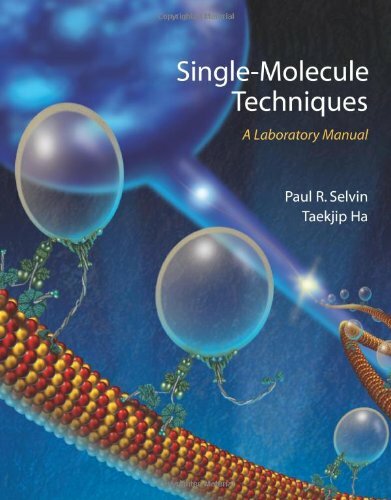 The book is edited by Paul R. Selvin and Taekjip Ha, two pioneers in the field of experimental biophysics who have made significant contributions to the development and application of single-molecule technologies. Partial contents: 1. The New Era of Single Molecule Biology (P.R. Selvin and T. Ha); In Vitro Fluorescence: 2. TIRF-FRET (T. Ha); 3. In Vitro and In Vivo FIONA and Other Acronyms for Watching Molecular Motors Walk (P.R. Selvin); 4. Imaging of Single Fluorophores at nm Resolution (J. Spudich and S. Churchman); 5. Advances in Surface-based Assays for Single Molecules (P.M. Fordyce, M.T. Valentine, and S.M. Block); 6. Alternating-Laser Excitation of Single Molecules (A.N. Kapanidis, M. Heilemann, E. Margeat, X. Kong, E. Nir, and S. Weiss); 7. Scanning Probe Nanometry for an Actomysin Motor (T. Yanagida); 8. Orientational Imaging (Y. Goldman); 9. Gold Particles (A. Dunn and J. Spudich); Fluorescence in Living Cells: 10. Enzymes and Living Cells (S. Xie); 11. Fluorescently-labeled Virus Capture (X. Zhuang); 12. Probing Gene Expression in Live Cells (S. Xie); 13. Quantum Dots and Live Cell Measurements (M. Dahan); 14. Imaging Real-time Gene Expression in Living Systems (R. Singer); 15. Fluorescence Correlation Spectroscopy Step by Step (E. Haustein and P. Schwille); Optical Traps: 16. Regular, 2-Bead Optical Traps and Myosin (J. Spudich); 17. High-resolution Dual Trap Optical Tweezers with Differential Detection (C. Bustamante, Y.R. Chemla, and J.R. Moffitt); 18. Single Molecule Imaging of Cell Signaling (T. Yanagida); Magnetic Traps: 19. Magnetic Traps (V. Croquette and D. Bensimoun); Force Probes/afm: 20. Probing Polysaccharides and Protein Mechanics by AFM (M. Rabbi and P.E. Marszalek); Channels: 21. Single Molecule Analysis of Nucleic Acids and DNA-protein Interactions Using Nanopores (M. Wanunu and A. Meller); Appendix; Cautions; Index.